This is truly a Greek accompaniment for many dishes. 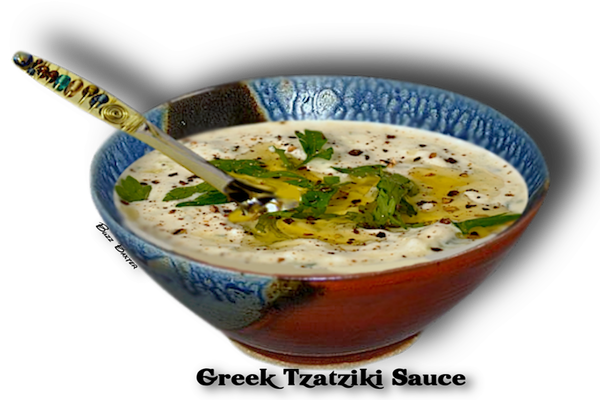 It is a Greek dipping sauce, "mayonnaise", and an impossible to do without condiment for many Greek dishes. Thick Greek Yogurt, cucumbers, garlic and Greek olive oil make this a never to forget favorite for travelers to Greece. 1. 1st day: Making the yogurt cheese. of soft cream cheese. Draining overnight should do the trick. 2. 2nd day: Preparing the cucumber. shredded cucumber and squeeze out the juice into the sink (discard). 3. Putting the sauce together. another wonderful touch. Garnish with a few Kalamata Olives,  a lemon wedge or fresh basil sprigs.